I think we need to start with the basics. What causes my deep lines and wrinkles? As we age, our faces naturally lose fat. As this fat layer disappears, our facial muscles are forced closer to the skin’s surface. Smile lines and crow’s feet become more noticeable. Sun exposure, heredity and lifestyle choices cause facial skin to stretch making the fat loss look worse. (You'll often hear it called volume loss.). Fillers help to restore lost fullness to the face, lips, and hands. Juvederm Vollure and Juvederm Volbella are both manufactured by Allergan. They are fillers made from a kind of hyaluronic acid. Hyaluronic acid, is one of the main components of the dermis (the middle layer of your skin), that gives skin firmness and fullness. It binds to and absorbs water creating volume in your face. When injected into wrinkles, Juvederm "fills" your lines and wrinkles. What's the difference between Volbella and Vollure? The differences lie in their thickness. Volbella is the thinnest and works well for vertical lip lines and filling lips. Juvederm Vollure is thicker and "fills" moderate and deep wrinkles and folds (like smile lines). Volbella lasts about a year; Vollure is advertised to last up to 18 months. Are there other brands of hyaluronic acid fillers? Yes, there are several other brands including Captique, Esthélis, Elevess, Hylaform, Perlane, Prevelle, Puragen, and Restylane. Are these other hyaluronic acids as safe as Juvederm? According to Dr. Brandith Irwin, not all fillers are created equal. Juvederm, Restylane Lyft, and Restylane have the best safety profiles and get the most consistent results. Read more in her blog post, Guide To Dermal Fillers: Restylane, Juvederm, Voluma, Sculptra. Juvederm and other hyaluronic acid fillers are used to fill smile lines, plump thin lips, fill shallow contours, and improve the look of recessed scars. In general, they are used on the lower part of the face, from the eyes down. Not all hyaluronic acid fillers contain lidocaine. If you are concerned about pain, you should ask your injector to use a formulation with this anesthetic. It significantly cuts the pain. That said, you may feel a burning or stinging as the hyaluronic acid gel is being injected. All of the Juvederm formulations used in the U.S.A. include lidocaine. They are designated with the "XC" label. What are the injections like? Prior to injections, you may have ice or a topical anesthetic applied to your skin. This is dependent upon the filler used and the area to be treated. Your medical provider will inject the filler into the areas you want treated, often giving several injections to get the best result. You may feel a burning or stinging as the hyaluronic acid gel is being injected. To reduce any swelling and redness, your injector may recommend icing the area for 15 - 20 minutes after the treatment. You will be able to gently apply makeup prior to leaving the office. Most people find the results last from 9 to 12 months. For more information, go to Juvederm.com and read our blog post, Juvederm and Hyaluronic Acid Fillers. How long do the injections take? Most treatments take 15 - 30 minutes and one office visit. Juvederm and Restylane are often priced by the syringe. 1 syringe ranges in price anywhere from $450 to $750. The price often goes up with the qualifications of the injector and the thickness of the formula. For example, a plastic surgeon will charge more to inject than a medical aesthetician will. Thicker hyaluronic acids cost more than thin ones. Different areas will require different amounts (in this case, numbers of syringes) of Juvederm. You will need to talk to an experienced injector to see what he / she recommends. The good news is, most medical spas offer free consultations. The most common side effects are temporary and usually disappear within 7 - 14 days. These include redness, swelling, tenderness, itching and occasionally, bruising. Are there any bad side effects I should know about? Yes, there can be. The FDA recently came out with new warnings that fillers can be accidentally injected into blood vessels causing RARE but SEVERE side effects such as stroke, visual impairment, blindness, and death of the surrounding skin and underlying tissue. Juvederm Volbella Before & After. Photo courtesy of Allergan. Juvederm Vollure XC Before & After. 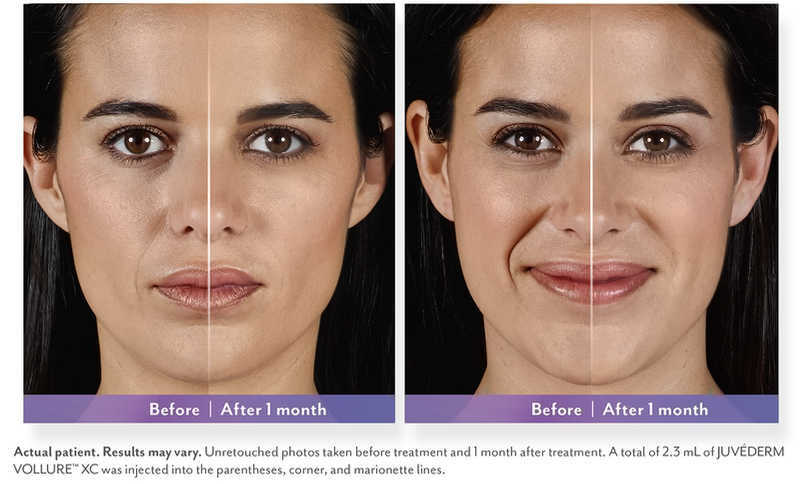 Photos courtesy of Allergan. If I look overfilled or get a bad side effect, what can I do? Call your medical injector - immediately if you get one of the severe side effects listed above! One of the reasons I like Juvederm and other hyaluronic acid fillers so much is that they are immediately reversible. The hyaluronic acid is quickly broken down with a shot of the enzyme, hyaluronidase. You shouldn't get fillers - of any kind - if you are pregnant or breastfeeding. People with multiple severe allergies, people who have had severe allergic reactions (anaphylaxis), and those allergic to lidocaine shouldn't use Juvederm. People who bruise easily may not be good candidates either. Talk to your injector to be sure. Are Juvederm and hyaluronic acid fillers worth it? The Juvederm brand of fillers has a 91% "Worth It" rating on Realself.com. Patients love Juvederm because they can return to everyday activities right after the injections. The results are immediate!